If you want to straighten your smile, but don’t want to draw attention to your mouth in the process, Invisalign may be a great option for you. Invisalign took the orthodontics world by storm when it was first introduced, and for good reason. Patients have the ability to perfect their smiles through a series of comfortable, removable and virtually invisible aligners. Invisalign treatment consists of a series of aligners that are usually replaced every two weeks. Each set of aligners is perfectly calibrated by Dr. Polan, who is an Invisalign preferred provider for 2016, to guide your teeth to a new location, with the end result being a beautiful and great functioning smile. 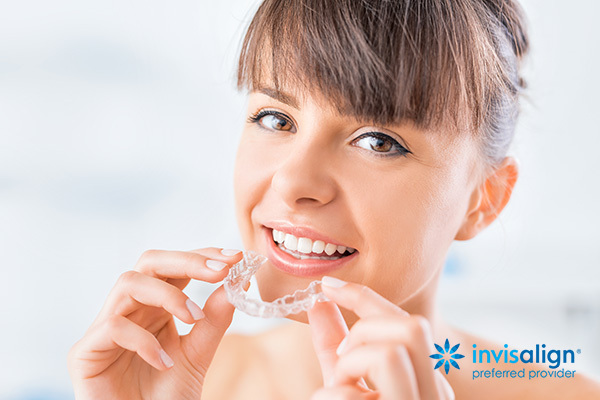 Today, Invisalign can be used to treat a variety of cases, including crowding, spacing, overbites and underbites. Patients love it because it fits seamlessly into their lives, and orthodontists love it because it produces excellent results. If Invisalign is right for you, Dr. Polan will take x-rays, pictures and impressions of your teeth that will then be used to create 3-D models of your teeth. This unique 3-D imaging allows Dr. Polan to map out precise treatment plans for all of his Invisalign patients that will show you the exact movements of your teeth with each set of aligners, and give you an idea of how long your treatment will take. Your aligners will be made of a clear and smooth plastic that feels comfortable in your mouth. Because they are removable, you don’t have to alter your diet in any way. Like with braces, it is still important that you do a great job brushing and flossing to keep your teeth healthy and beautiful during treatment. You’ll come back for checkups with Dr. Polan about every six to eight weeks to ensure your treatment is on track, but if you ever have questions or concerns, our staff is always available to answer questions. For the best results, you’ll need to wear your aligners about 22 hours a day throughout the course of treatment. Invisalign can provide exceptional results, all while being virtually invisible to those around you. Schedule a consultation today to discover the power of Invisalign.